Spin your way through Spinningfields to raise cash for Forever Manchester. Ever wanted to compete in a bike race with other Manchester businesses but just don’t trust the unpredictability of the Manc weather? Well, we’ve got the perfect challenge. Spin Factory, a new spinning gym located in Spinningfields is the largest of its kind in Europe and they’re challenging businesses to race to raise funds for Forever Manchester. 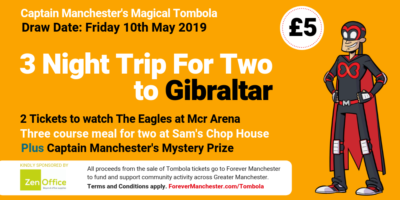 Businesses can enter teams with a maximum of 10 members priced at £10 per person with all money from the ticket sales coming to us at Forever Manchester. All teams will start at the same time and ride to a soundtrack of five Manchester music tracks. People will be asked to ride to the beat of the music and then there will be a short sprint session during each music track. The team that travels furthest during the session will win the Forever Manchester Spin Factory trophy. – it’s a very prestigious award, you know? The whole event with your staff should take no longer than an hour. The Spin Factory staff will handle registration when you arrive, and they’ll give you a tour around the bike and teach you how to use them properly, to ensure there’s no injuries! Cost: £10 per ticket with all proceeds from ticket sales coming to Forever Manchester.